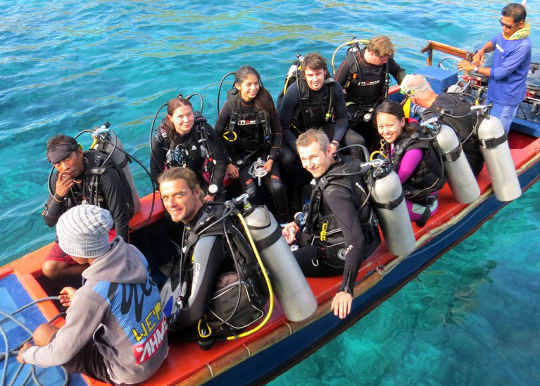 With a maximum of just 10 guests on board this liveaboard, the Moana offers you an escape from big groups and guarantees plenty of individual attention in a variety of dive crew languages. 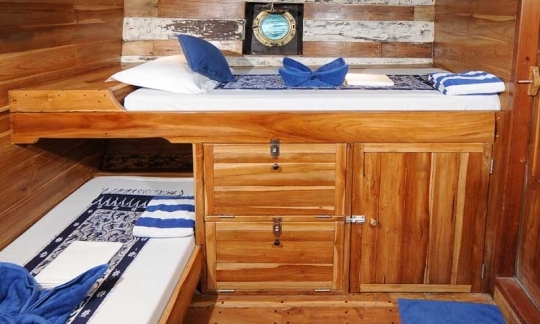 This compact Phinisi schooner has 5 air conditioned cabins all with ensuite showers. 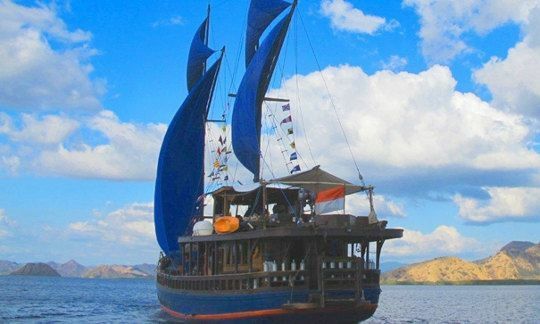 The boat may be less than enormous, but is modern and perfectly formed and is a great boat for individuals, groups or families to see the best of Komodo dive region. 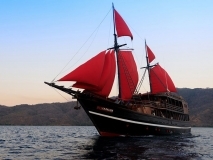 Moana is ideal for those looking for an affordable and short Komodo diving adventure. 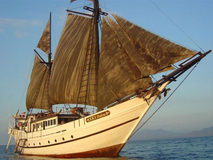 The tours encompass all the best dive sites of the area plus a walk with the famous Komodo dragons, while all the time you are looked after by the attentive and friendly crew. 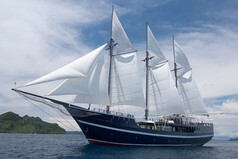 Moana departs from Labuan Bajo in Flores, just a short hop to Komodo. 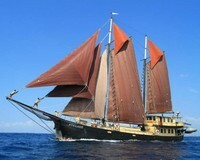 Flores is reached by a quick domestic flight from Bali. 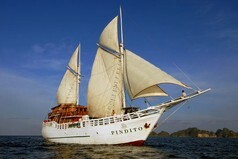 The proximity to the best dive sites means no long cruises across open seas. 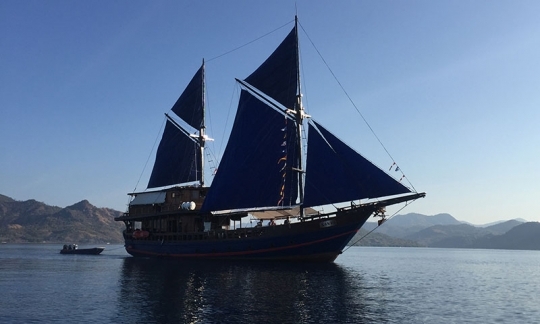 Unlike some of the other Indonesia liveaboard charters, with the Moana you will be scuba diving in Komodo just a few hours after boarding! 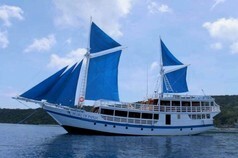 Cruise price per person includes: Cabin accommodation with air-conditioning, breakfast, lunch, dinner, snacks, drinking water, soft drinks (only Coke and Sprite), hot drinks, land tours, transfers to the boat from the airport, dives (as detailed in the trips above), experienced English-speaking divemaster(s) (max 5 divers per DM), tanks, weights and weightbelts, safety marker device. 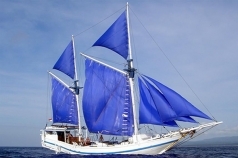 Cruise price per person excludes (mandatory, unless customer provides own): Scuba equipment (US$ 225 per trip), dive insurance, port clearance and Komodo National Park fees of US$ 141 per person per safari to be paid in advance. Unless otherwise stated, all the listed items need to be paid on arrival. Optional extras: Alcoholic drinks, torches, dive computer. Unless otherwise stated, all the listed items need to be paid on arrival. 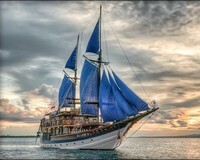 How to get there: The Moana liveaboard departs to Komodo at about 10:00 hrs from Labuan Bajo in Flores. 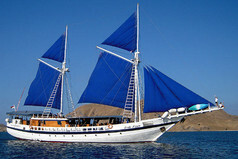 There is a transfer service from Labuan Bajo Airport to and from the boat. 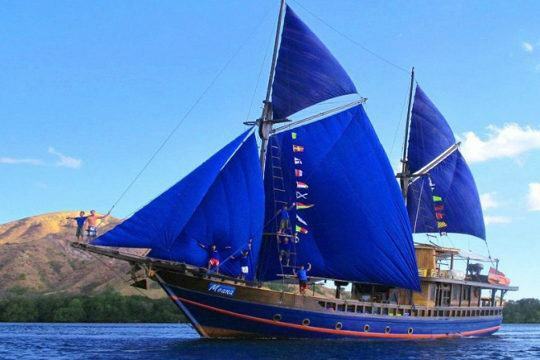 You can fly direct to Labuan Bajo from Bali. Flights are arranged by the operator at the time of booking. Speed boat transfers to and from the boat are available any day on request for those with more flexible schedules. 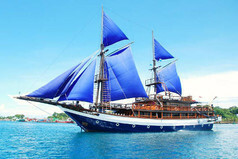 For more information on how to get to Bali see our Bali travel information section. 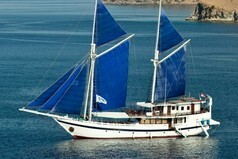 The last dive of the trip will be at around 13:00 hrs on the day before disembarking. Please wait at least 18 hours before flying after diving. Non-diver rate: 16% off the published price. 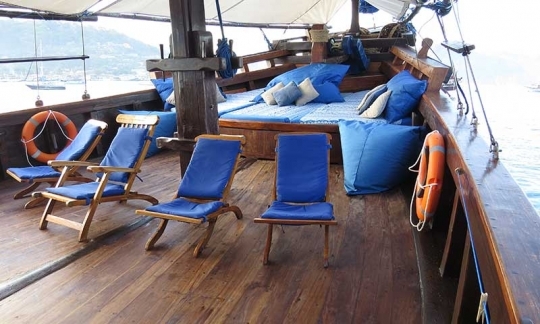 Dive clubs and group discounts: Pay for 10 guests and 1 additional person can join the cruise sleeping in the saloon free of charge (total 11 guests). 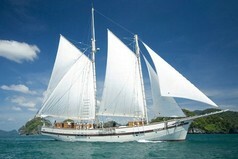 See whole boat charter rate below. 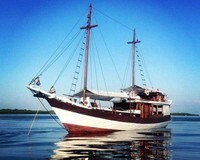 Whole boat charter rate (per night): 5 night trip - US$ 3 532. 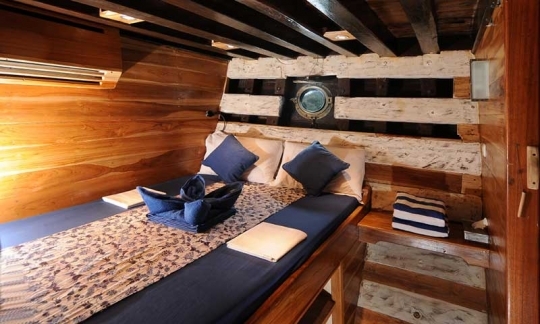 Moana has 1 large Standard cabin with a huge double bed which could be used for a family accommodating 2 parents and a young child. 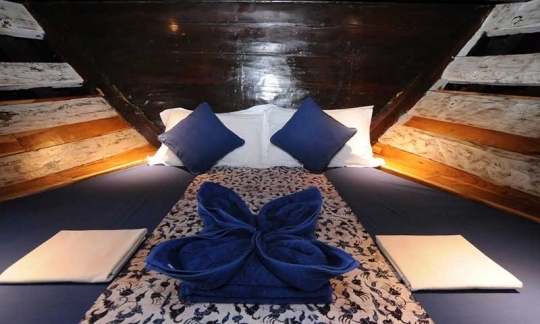 There are 2 Standard double bed cabins and 2 Standard twin cabins, each with 2 single beds (bunk bed style positioned in an "L" design). 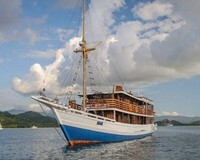 All cabins are on the lower deck - all are air conditioned, tidily furnished and have teak wood interiors. 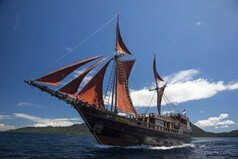 The Moana has all the facilities needed to keep you entertained during your Komodo trip. With an I-pod for music and a great sound and light system, you can set the mood for yourself: mellow vibes or party time! In the open air you can enjoy the large sundeck and even take advantage of the outdoor sleeping facilities for a night under the stars. Camera rinse tanks and a camera table are available for photographers. 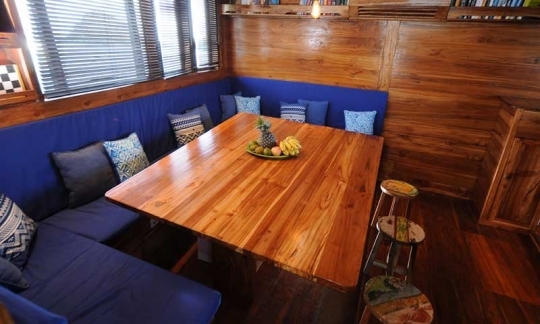 Chinese, Indonesian, Italian, Japanese and international main meal dishes. 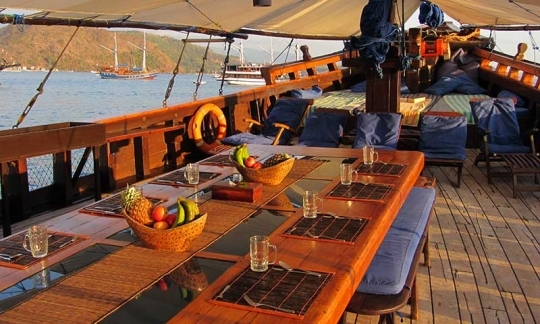 Buffet-style breakfast with lunch and dinner served, outdoors on the main deck - choose from 2 main dishes. 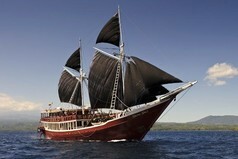 The cruise dining service begins with lunch on the first day of these Komodo liveaboard trips. Coffee, tea, milk, fruit, biscuits, snacks and drinking water are all free of charge. Vegetarians and other diets can be catered for - please send us your requirements. 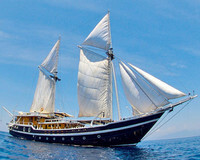 The dive operator rates the onboard catering as very important and high quality. 12 litre aluminium tanks with international fittings with DIN inserts.